You may be wondering what the best distortion pedal would be for you to rule the stage with your brutal riffs. You may think that great gear comes at a hefty price, but you can rock out like your favorite guitarists with less investment than you think. If you have a guitar, the next step is developing your sound through the use of pedals. The metal genre is known for heavily distorted guitars and, in this genre, grit and dirt can be a good thing. Keep on reading for the best distortion pedals for metal. We’ll start the list with a pedal that covers a lot of ground. 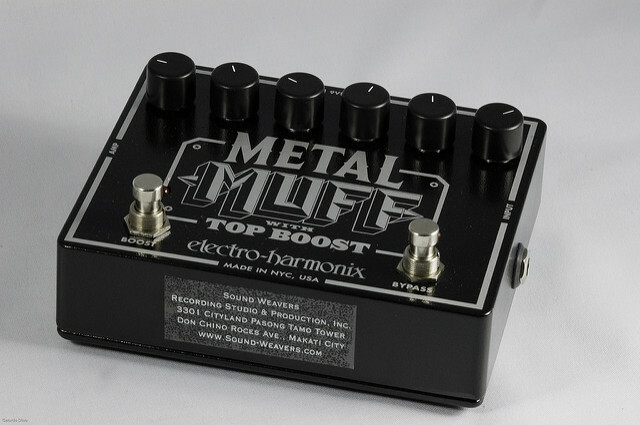 The Metal Muff Distortion could very well be a great alternative for players who aren’t able to shell out the cash for a high-end tube amp. One of the great draws of this pedal is the fact that it comes with a 3-band EQ, which can boost or cut low, medium and high frequencies by 14dB, 15dB, or 10dB, respectively. The tone of this pedal lends itself more towards heavy metal as a subgenre. This pedal is great for riff warriors and soloists alike. It has six knobs and two buttons, which are all fastened on a vintage late 70s style faceplate, The knobs are for overall volume, Top Boost, your 3-band EQ, and the distortion. The buttons include your standard bypass and a toggle for the top boost. Single In/Single Out connections and a 9V power connector round out the unit. 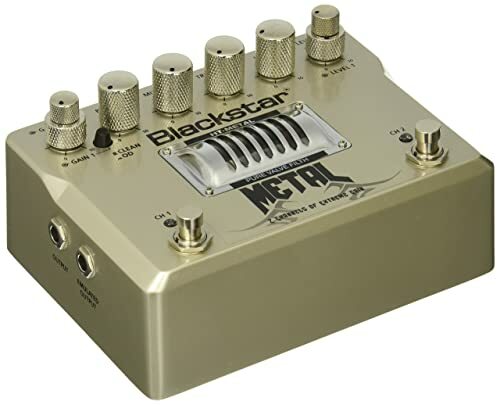 Blackstar is a company known for their quality amplifiers in the rock scene, and they’ve come out with a pedal that lives up to that reputation. Housed within are cascading tube gain stages and the tube amp response that a lot of artists love. It gives a very authentic grit to the sound without it being too digitized with gain and distortion. Granted, you can push everything to 11 and achieve that type of sound, but this pedal has its best sound with a good mix of the settings. To power this vacuum tube circuitry, the HT-Metal requires a 300V DC power connection. This pedal has a bunch of features, including a 3-band EQ, Clean/Overdrive switch, and a tone shape knob. Basically, this pedal is good to carry any performance right out of the box. Truly the Dr. Jekyll and Mr. Hyde of this list, the Wampler Triple Wreck has a very defining switch built into it. At the top of the pedal you can choose between HARD and BRUTAL. The former gives a warm low end hit to your tone, which can really bring out rhythm parts. Stand back if you want to switch this puppy to BRUTAL, because you’re in for a smattering of luscious high end that’ll cause anyone to headbang through the closest wall because of how metal it sounds. This setting adds a small amount of high end to your playing, effectively filling out a spectrum of sounds. 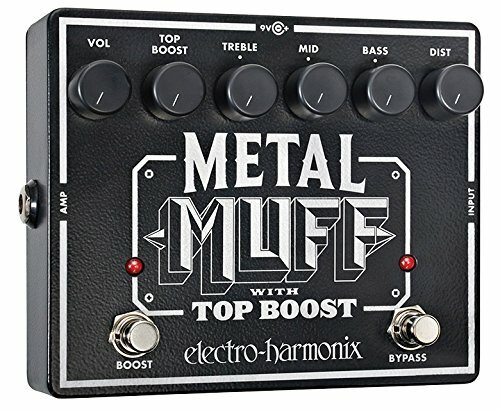 Even without this feature that is truly a gift to (metal) mankind, it comes with EQ knobs and a boost system for turning the volume as high as you want. 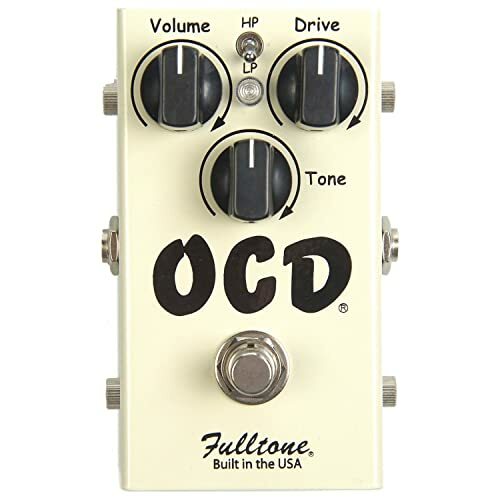 If toggling knobs all day is more of a chore than anything else, you might want to check out the Fulltone OCD Pedal. This one comes with three knobs, volume, drive, and tone. Volume is pretty self-explanatory. The drive knob can turn up the grit, and tone handles the shape of it. Between the volume and drive knobs is a switch that can be flipped to either High Pass or Low Pass. High Pass will take out the lower or bass frequencies, while Low Pass gets rid of the higher tinny frequencies. Pretty simple list of options, right? To add to the ease of use is a very distinct tone that has a suprising amount of quality given the affordable nature of this pedal. This pedal comes from the geniuses over at Dunlop. You may have known them for their picks, strings, or their most popular pedal, which is the Cry-Baby Wah Pedal. With the MXR M116 Full Bore, you’ll sure cry tears of joy. For a heavy industrial sound, you should pick up this pedal. It even looks like a slab of metal was given knobs and melded into this beast. The M116 offers 3 EQ knobs (Low, Mid, and High) along with standard volume and gain. Two extra buttons on this pedal give it an edge over the competition, and they are Gate and Scoop. The Gate button will bypass the pedal when you aren’t playing above a certain volume. This is great for getting rid of leftover buzz that might be in a highly overdriven signal, leaving you with a silence that really brings out techniques like palm muting and any type of staccato riff. The scoop feature is a common practice with guitars in metal. Though some musicians don’t take kindly to it, a signature guitar setting is to get rid of the low and high frequencies of a guitar in a mix, which allows it to sit better with other instruments. All this can be done with the press of a button on this pedal. 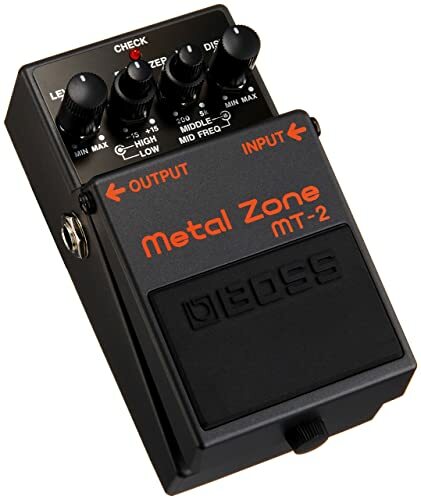 Thought of as one of the most tried pedals for metal and rock, the Boss MT-2 Metal Zone offers a no frills, all gain experience that is known throughout the industry. Why is that? Well, a feature that is called buffered bypass. What this does is it makes sure that nothing is blocking the voltage signal from flowing, and this leads to a stronger signal. Plenty of true bypass pedals cause a small loss of signal on guitar cables that exceed certain lengths. These signals may not be noticeable, but like bass in a song you’ll realize how much was missing when you add it in. Some might say the tone is less than perfect, but it was a tone that musicians remember from the 90s that ushered in a lot of bands. Technology throughout the world will get an upgrade at some point and this pedal is a perfect example of that. 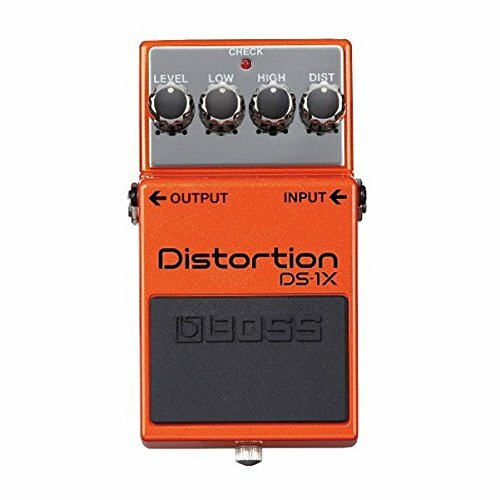 The DX-1X is an upgraded version of Boss’ well known DS-1 distortion pedal. It sports a darker orange coloring which can hint at the darker and more aggressive tone it provides. This version also has more headroom than the previous version, which can allow you to crank up the gain for a more metal tone. Speaking of tone, the single knob of the DS-1 was replaced by TWO knobs, a low and a high, to handle EQ. Unlike the previous Boss pedal we looked at, the DS-1X was an upgrade made to cater to more modern metal. Next up is a pedal with both “rock” and “metal” in its name, so you know you’ve got a solid contender. 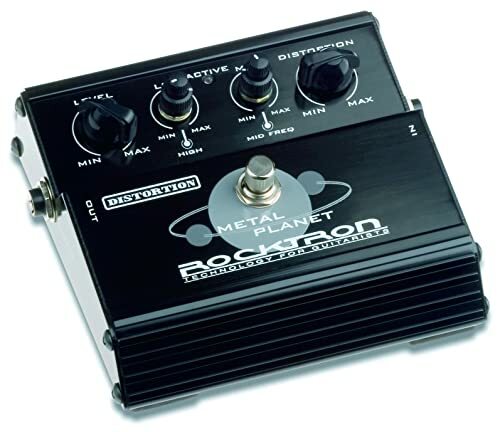 The Rocktron Metal Planet pedal is out of this world when it comes to sounding like 80s metal. You can shape the tone to sound like Marshall and Mesa Boogie amps from that same time period. That’s not the limit of the pedal though, because you can unleash high gain, overdrive and distortion all with equal intensity depending on the settings you like. The Metal Planet also comes with some interesting knobs for its 4-band EQ. There are only two of them, but the top portions are separate bands than the bottom, and you can rotate them to change the tone to whatever you want. The gain on this pedal is insane, and might be a little overwhelming out of the box. However, tweaking the EQ settings and volume will make it feel right at home. Ah, the TC Electronic Dark Matter. 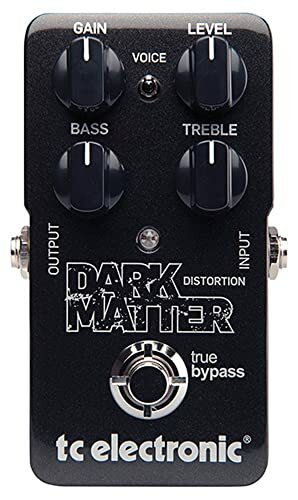 The most cost-effective pedal on this list, the Dark Matter and its simple layout are a great starting point for guitarists to learn how to create a good tone. It comes with four knobs: Gain, Level, Bass and Treble. In between the gain and level ones is a switch that will shape the voice of the pedal, giving it either a more modern or a more vintage sound. The distortion on this pedal somewhat resembles a tube amp due to the fact that the character of it changes as you crank the gain knob. Bass and treble are standard tone changers. Has a low ability ceiling, there’s only so much you can get out of this one. 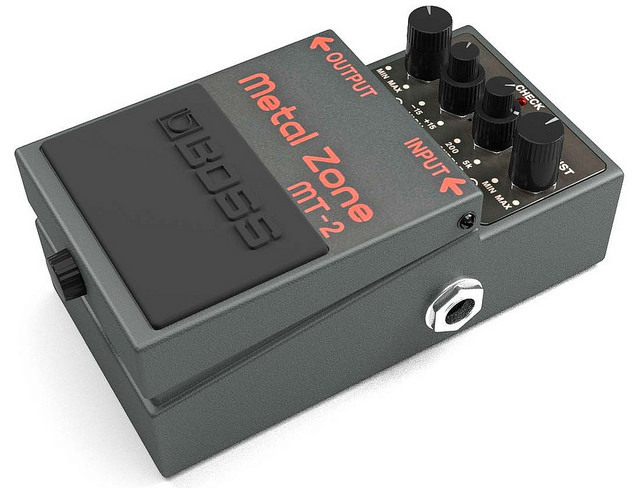 To round out this list, we have a pedal that is perfect for any beginner to the metal genre. This pedal, the Behringer Ultra Metal UM300, makes the bold claim that it can stand up to most pedals above its price range. The amazing thing is, they got pretty close. It comes with multi-gain circuitry to give somewhat of a tube-like edge to it. It comes with a 3-band EQ and a mid-frequency sweeper knob. This is useful for the most important frequency area for metal because you have full control over which mid-frequency you want to highlight. The electronic on/off switch is designed to keep the signal strong when in bypass mode. That’s not all. The sustain on this pedal is insane and can hold notes for an incredible amount of time. Generally, using a guitar pedal is a pretty simple matter. It is a small link between the guitar and you amp/computer. For basic setup, use a ¼” instrument cable to connect the guitar to the input of the pedal, as well as connecting the output of the pedal to the input of your amplifier or interface. Also make sure that the pedal is plugged in or has a battery installed in the back (if batteries are supported, it will most likely be a 9V). From there, tweak the settings for your desired tone. Make sure the pedal is on by hitting the footswitch. This will normally cause a light to turn on somewhere in the unit. Twisting knobs right will increase how audible a particular effect is, and twisting them left will decrease it. Play around a bit and find your signature sound, but be sure not to crank all of the knobs up at the same time. The sound will be fairly unpleasant and the neighbors will be knocking down your door in protest. Metal has changed quite a bit over the past 30-40 years. With new genres emerging and the classics still being played worldwide, options for pedals have grown ad infinitum. In most instances, players will have a specific sound they are going towards depending on what they write and what their bandmates are looking for. Be sure to try out as many of these as you can at your local guitar store. If you have the resources, simulate your effect chain right down to the amp and guitar. Understand exactly what the pedal will be like when you have it as part of your rig. If you don’t have any form of EQ control, then a distortion pedal with 3 or 4-band EQ would be very beneficial. 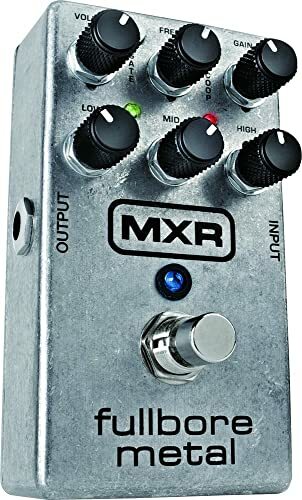 Some pedals on this list, like the Metal Muff and the HT-Metal, are great as preamps as well, so these could reduce the amount of clutter on your pedalboard. To finish, let’s get to what you all were waiting for. 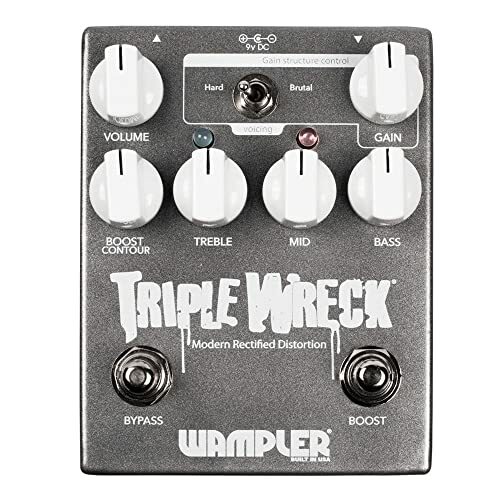 With all factors taken into consideration, the best distortion pedal for metal would have to be the Wampler Triple Wreck V2 Modern Rectified. The added features, like a 3-Band EQ and the ability to use the Boost for extra volume when needed, make this pedal shine above the rest. Couple that with the fact that it can change intensities at the flip of a switch, and you’ve got an incredibly versatile pedal that can stand toe to toe with high end tube amp distortion. Stay as composed as Jekyll, or unleash your inner Hyde, by picking up this pedal today.